The year was 1979: the location – Carmarthen: THE person who had the idea of a Welsh Talking Books scheme was Rhian Evans, a blind librarian at the then Trinity College. She enlisted the help of Alun R Edwards, who at the time was the chief librarian for Dyfed. The scheme was funded by a Government Jobs Creation grant. Four years previously Rhian had started the Carmarthen Talking Newspaper, recorded at Radio Glangwili, the Carmarthen Hospital Radio Service. In 1989, when the Government funding ceased, the North Wales Society for the Blind came to the rescue. Books were recorded in Bangor but primarily in Carmarthen under Rhian’s supervision. Welsh books and books relating to Wales have been recorded onto cassette – nearly 2000 in all. 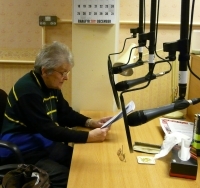 Towards the end of 2010 The North Wales Blind Society faced a financial crisis. It decided that the Carmarthen end would be closed down, the titles moved to Bangor, leaving two part-time workers without a job. Immediately a small group of interested people was formed to save this vital service to blind, partially sighted and those having difficulties reading print. Within months they had succeeded in obtaining a grant from the Welsh Government – £35,000 – to relaunch what was once called the Welsh Cassette Scheme as Llyfrau Llafar Cymru / Talking Books Wales. This new service will be officially launched in January 2012 at the Welsh Assembly.